Shrewsbury residents invited to ‘soak’ officials to benefit local organizations. Home Shrewsbury Shrewsbury residents invited to ‘soak’ officials to benefit local organizations. Soak event organizer Donnie Green gets soaked by his wife Janet at the 2017 event. Shrewsbury – A number of Shrewsbury officials, as well as members of the town’s police and fire departments, are no doubt hoping that the hot and humid weather continues on for a bit, at least until Thursday, Sept. 13. That’s because, that evening, they will be participating in the second annual Shrewsbury Soak fundraiser. The event will be held on the front lawn of the town hall, 100 Maple Ave., starting at 5:30 p.m. The participants will each willingly get doused with a big bucket of water in exchange for a suggested $10 donation. Proceeds raised will go towards Shrewsbury Youth and Family Services, the Shrewsbury Parks and Recreation Department, St. Anne’s Human Services, the Shrewsbury Council on Aging, the Shrewsbury Public Library, and Shrewsbury Little League and Softball. The event is once again being organized by longtime Shrewsbury resident Donnie Green. Green anticipates there will be approximately 40 volunteers agreeing to get “soaked” that evening, including members of the Board of Selectmen, local first responders and a number of high school students, among others. 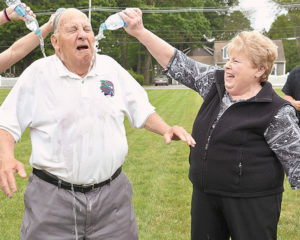 Last year even he got doused by none other than his delighted wife, Janet. Green is also asking local businesses to consider making donations of gift cards for a raffle that will be held as well. Those interested in donating or volunteering may call him at 508-845-5071.